Singh’s remark comes after Rahul Gandhi continued his 'chowkidar chor hai' barb, in a veiled reference to Prime Minister Narendra Modi. 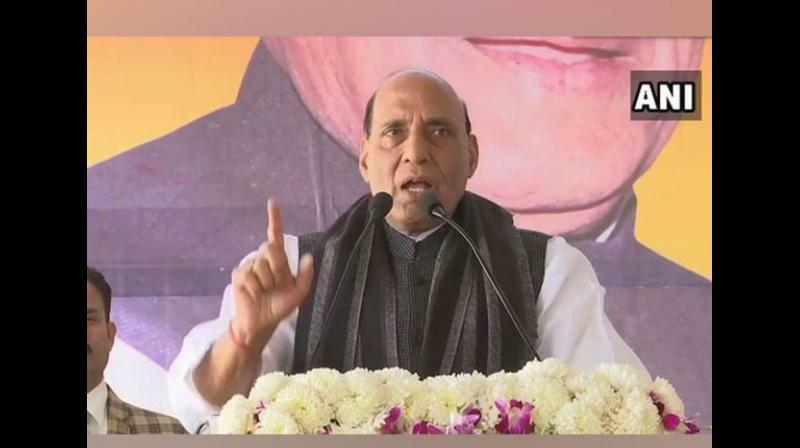 Moradabad: Union Home Minister Rajnath Singh on Monday denounced Congress president Rahul Gandhi's persistent 'chowkidar chor hai' jibe against Prime Minister Narendra Modi and coined a rhyming slogan in his defence. While addressing a rally here, Singh said that the Prime Minister is not a "chor" (thief) but "pure and that he is the only "cure" for the country. Singh’s remark comes after Rahul Gandhi on Monday continued his "chowkidar chor hai" barb, in a veiled reference to Prime Minister Narendra Modi, saying that his party would not sit idle until a government based on Congress ideology is formed in Uttar Pradesh. Attacking the Prime Minister, Rahul alleged: "The country's 'chowkidar' looted the people of Uttar Pradesh, the Air Force and others in the country. Chowkidar chor hai!"